Looking good Doug. It will still be quite some work to integrate in the train circuit with a high enough input and output. Ik wanted to use only parts that I already had as a challenge, no Bricklink orders. It shows I also like Modular buildings and it is completely different from the technical work done here but I hope you like it. Looks really good, is the track switch opertated by the reverser or is the the green train just sitting on the siding getting charged. Assume the orange train being fed by the conveyor and GBC ball input box. Will probably be a stand alone system but will see if can adapt to GBC requirements. What are the standars for input /output boxes etc. 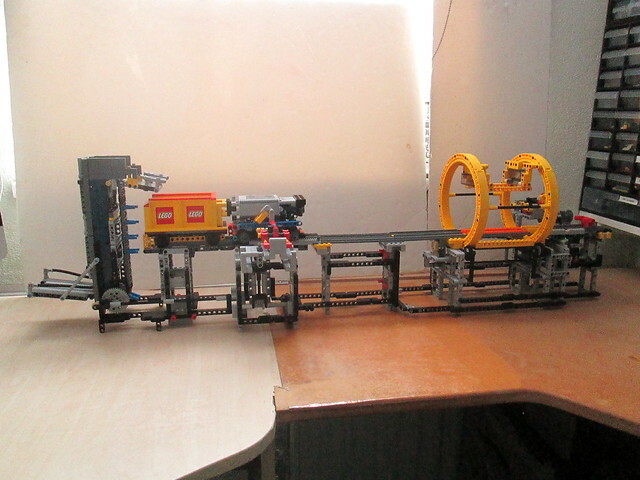 Now working out the throughput required on the conveyor, so far it would running at 15 balls per trip cycle but easy to increase by adding closer spaced lift beams and changing the drive gear ratio. Each trip cycle takes about 17 secs. so x 15 = 52 balls per min so by adding more beams should get 21 balls per trip = 74 balls per minute. 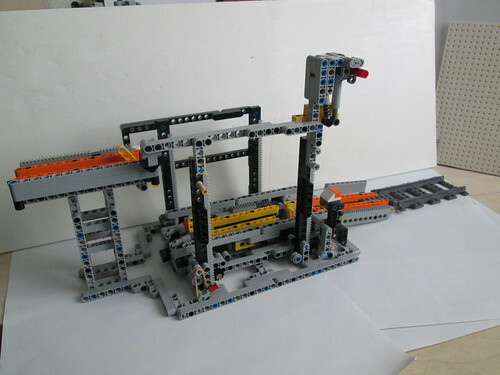 Inconnecting track can be as long as required using standard Lego track with adaptors to connect to the 16L track beams without any gaps. Looks really good, is the track switch operated by the reverser or is the the green train just sitting on the siding getting charged. Input and output ten studs high and ten studs wide (with walls so leaving 8 studs for a container), 1 ball per second. That's it. Also named 'Ruby Goldberg', the first one to come up with this standard. One ball per second during a whole event is not really needed, there will always be waves of balls. Sometimes no balls come and than a wave. Thumb of rule is it should be possible to dump 30 balls in a GBC without problems. Thanks for the info. Will you have a minifig standing by to umplug charging cable & change the point switch ? My hopper waggon can easily carry 60+ balls so should be able to cope with a rush of balls. Going to adapt one of my loaders to suit the new Through Rotary Dumper. I will try to use the standard GBC boxes from parts I have - fairly limited number of parts, probably be multi coloured. I notice some GBC entry boxes have a rotating part to stir up the balls so they don't jam. May have to raide my grandson's collection of Lego now that he has moved onto other interests !! May have to raid my grandson's collection of Lego now that he has moved onto other interests !! Hello, I can't get A18016 TrainPassingModule, the file consist of 2 images and the partslist (that's my main goal) is conflicted. Can anyone help me? U can download all Akiyuki's files also from my bricksafe. Once you get to build it, pay close attention to the step on page 3 of 15 to get the racks correctly positioned. I got It wrong to begin with until Jonas pointed out the error, see an earlier post about this. Loader conveyor module finally built after several frustrating failed attempts to get it to synchronise with the train reverser at the loading end. The conveyor uses the the small sprocket 6 teeth wheels & with a 20:16 gear step up gearing runs at the same speed as Akiyuki version. Top of the hopper wagon had to be modified slightly to allow the 5L ball carrying beams clearance. The conveyor belt is tensioned using two small grey shock absorbers to prevent the chain hanging loose on the return run. Conveyor belt has 48 links, (as per Akiyuki version) & moves 24 links per loading cycle. Balls per trip cycle = 18 but could be increased to 21 or more if 5L beams placed closer together. 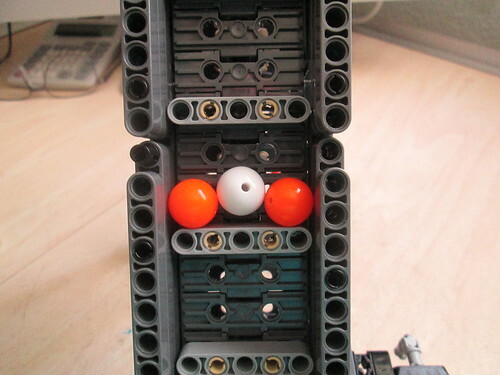 Conveyor module plugs into the loading end reverser module ( 4 x Red 3L pins with bush ). A bit more tidying up and bracing to do. The angle of conveyor is a bit steep at 60º but balls travel OK. May be able to reduce this once I build the ball input box. Had a few escaped balls, tested OK and now all balls drop into the hopper. Ball collecting chute & discharge conveyor. Doug’s Through Rotary Dumper system. 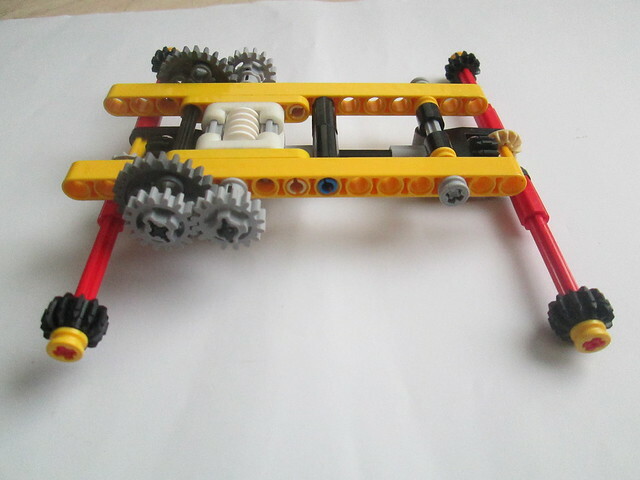 Conveyor Mk 1 built and uses Lego track links and 5L beams to carry the GBC balls..
Three balls do not always sit on the beam side by side and sometimes the centre ball falls back down again. At present there are 7 beams spaced 4L apart, this to be reduced to 3L apart to carry more balls per loading cycle. Rebuild & widen conveyor structure to give 6L between the sides, ball should then sit OK and transport without jamming or falling back down. Only way to reduce the slope angle is either to raise the entry box or install a longer conveyor belt, with problems synchronising again with the train reverser. Next length that will synchronise is 72 links, which is approx 39L between sprocket centers which is too long. Its amazing how balls find places to escape. Also need to devise a better ball entry box for the conveyor, as balls tend to jam if there too are many in the box. Does anyone one have a better design for an entry box which has a stirring arm to agitate the balls ? It took 10 attempts to get a half decent video, with balls ending up all over my hobby room !!! Its a bit shaky just like me but then I am not Cecil BeMille. Sorting out some odd quirks, mainly with loading the hopper wagon, that cropped up when shooting the video but its getting more reliable. All part of the fun building GBC modules. Had my calculator out and found I can lengthened the conveyor belt to 60 links and by using the large sprocket wheels with 10 notches, have managed to get it in sync with the train reverser. Each time the train enters the loading station it moves the conveyor belt 24 links before reverser trips the train to exit for another trip cycle. The reverser still uses the 2 lobe rotor. As conveyor belt is 5 x 12 links = 60 it will always stay in sync. The longer length allows for a shallower gradient to reach the discharge into the hopper wagon. The conveyor angle is now approx. 45º. Rebuilding conveyor with improved ball carrying and entry ball box. 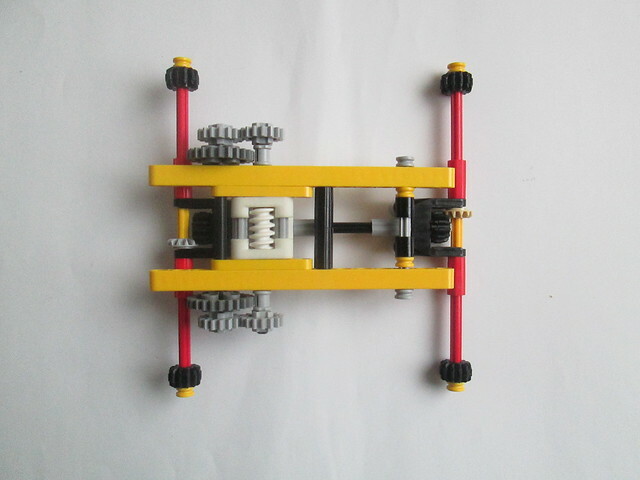 I have been working out the different combinations for the standard Akkiyuki reverser rotor and the number of conveyor links that are moved when using the large 10 notch sprocket wheels. 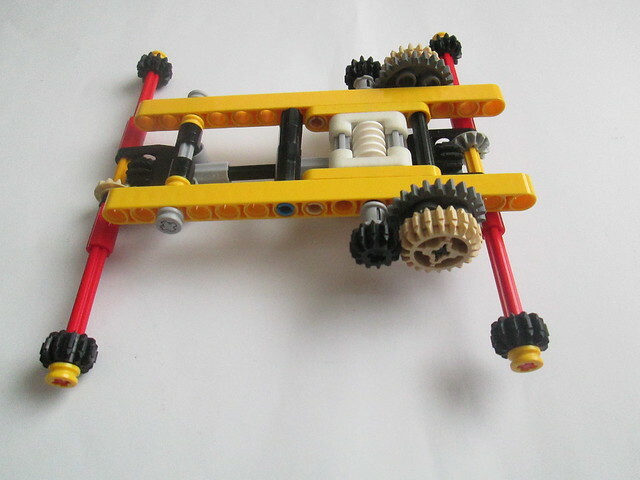 The same result can be obtained using the small 6 notch sprocket wheel, if a 20:12 step up gears are used to drive the conveyor. Multiples of these figures can be used for longer conveyors. 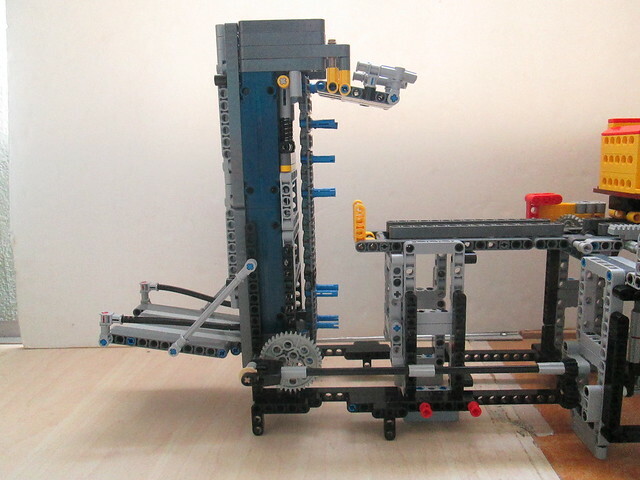 i.e i have just built a 60 link conveyor which works OK with two lobe rotor. Expect you are wondering how to get 3 lobes on the reverser module. This is longer than previous Mk 1 version with a chain length of 60 links giving an slope angle of approx 45º. Ball are lifted by 5L beams but some ball still fell l off backwards when conveyor in motion. Also rather large adding extra length to the whole module. i.e. an enclosed vertical ball lift which also used 5L beams to lift the balls,. However it frequently jammed if too many balls tried to entered at the lower level due to tight clearances. 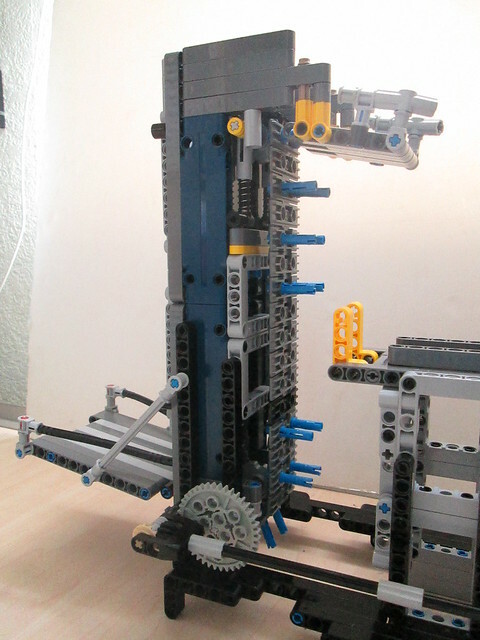 Time to re-design it using studless technic instead of a mix of studded & studless parts. Conveyor Mk 3 - Successful and working well, with a greatly reduced footprint. 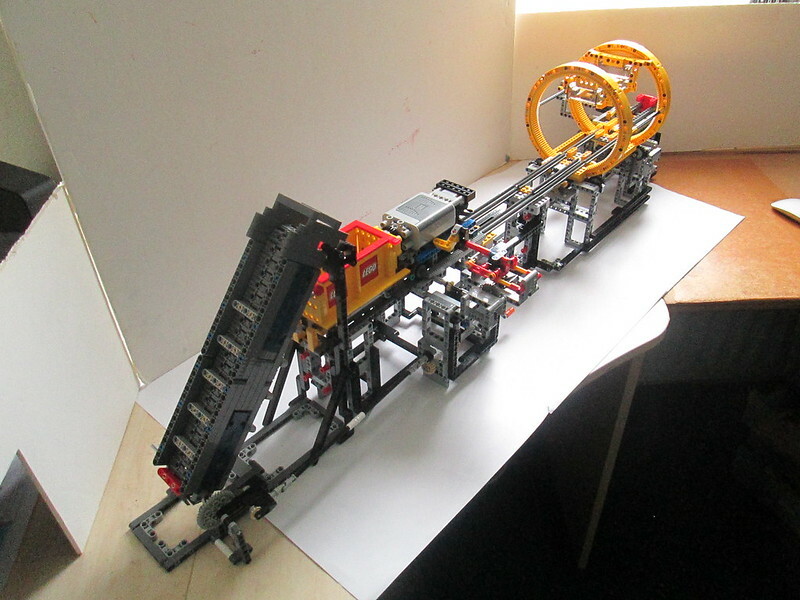 Conveyor chain is 36 links long and advances 24 links per trip cycle using a two lobe rotor in the train reverser. The train & hopper wagon make approx 3 trips per minute and can carry up to 30+ balls each time. This easily achieves the 1 ball per second criteria for GBC events. Trip time could be increased by adding extra plain 16L track beams. The amount of balls per cycle can be varied by reducing the number of lift pins.. Note there is a gap in the spacing of the lift pins every 12 links to prevent balls any balls discharging as train departs. This is because the conveyor only travels 2/3 rds. its length each loading cycle so each 12th link takes it turn to stop at the discharge point. Ball loading chute for testing purpose only would need to be re-built as per GBC rules for use at events. Mk 3 enclosed vertical ball conveyor. This has 36 links with blue 3L pins for carrying balls. Pins in pairs inserted every other link. The conveyor chain is kept taut by two small grey shock absorbers, seen at the top. This is essential for working of the vertical lift system. Next stage is the collection chute under the rotary dumper. I will probably build a smaller lift unit to lift balls onto a runway to allow them to roll by gravity back to the loading chute closing the loop to make a self contained system. Here is my take on Akiyuki's Railway System. I wanted to copy his final layout with all the units he designed for his system so I built them all and tested them individually before the final assembly, while keeping an eye on this topic. Running all of them reliably was not an easy task as a lot of things went wrong during the test process. In the end, I believe I succeed raisonably enough (as the video below can testify) but it’s really not a layout to run for hours at a GBC event. - The motor unit. Apart from the switch issue already discussed here, replacing the 2 axles with stop with one single 9L (also discussed here) really improves things. I also replaced one 1x5 liftarm (#11478) by two 1x2 liftarms (#41677) which leaves a cut below the battery box to nicely rout the PF motor cable. I have also cheated a bit, adding a small amount of Blu-tack (patafix) to fix the 1x2 Technic bricks beneath the bucket as I kept scattering them on the floor during my tests. 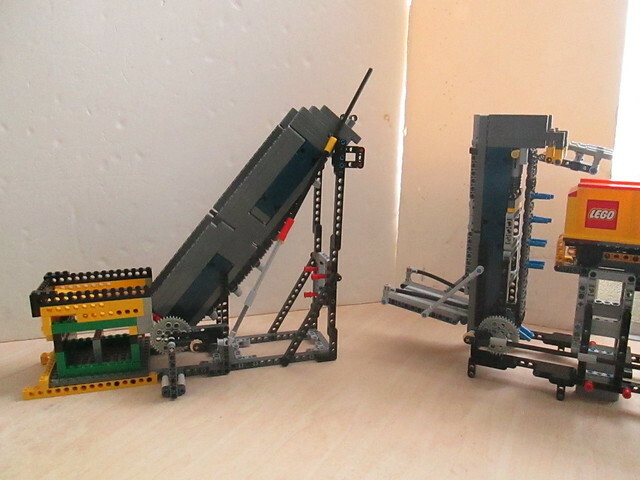 - Reverse Unit, Through Unit, Loader, Unloader, Passing module and Ballon Loop all worked well without any change. It was also true for the Reverse module V type until it suddenly got stuck. I had to remove the half-bushes around the worm gears to make it work again. - Passing Module Double Crossover : This one is my favorite design-wise, but it’s not trouble free. The train with the longest ride can get stuck while entering or leaving the unit. 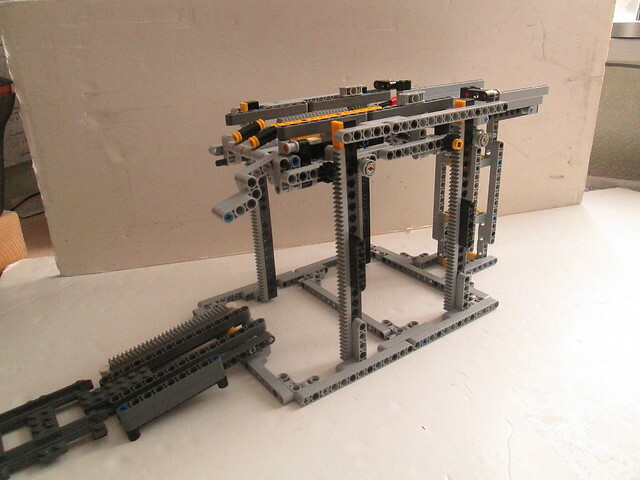 Modifying the rack assembly exchanging the 1x2 tile by a 1x1 (as it can be seen right at the beginning of Akiyuki’s Japan brickfest 2018 video) make it better but does not solve the issue completely. I added one rack part on a hinge and it seems to work ok since although I’m still not 100% satisfied. As discussed here, I also exchanged the red rubber belt for a blue one. 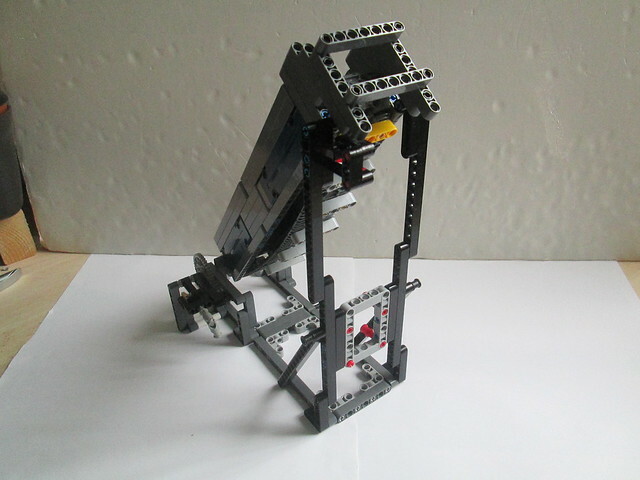 - Elevator module was a bit hard to tune but I did not make any change in the design and it performed quite well overall (well, except one time…). - Rotary module : Reliability wise, Akiyuki’s version was quite a nightmare really! So I built Doug’s version (Thank you @Doug72 !) with Dunes lxf file (Thank you @dunes !). Doug’s design was easy to set up. What’s more, when you get the right timing, it can’t go wrong again. I did not use his base though, I wanted to match the module to Akiyuki’s Elevator with the added bridge section. Fortunately, it was quite easy to mate Doug’s rotary unit to a slightly modified Akiyuki’s base (only the back part was altered to accomodate the mount for the yellow ring - I even kept Akiyuki’s original exit ramp as is). I have also found the trigger to be a bit too long to push the switch bar every time, and sometimes the train kept rolling… @Berthil limited the amplitude of the train switch to address this problem. I chose to reduce the trigger lenght by 1/2L. It worked very well but I had to increase the rubber belt tension a bit. Your rendition of the Akiyuki system looks good, I couldn't replicate it as didn't have the parts to make the sharp radius curves. I like your MOD to make space for the motor PF cable to pass through, will convert all my train units next time I change the batteries. The elevator module seems to be the most problematic now - I have had all sorts of crashes !!! Re locating 1 x 2 bricks for ball container on train units. 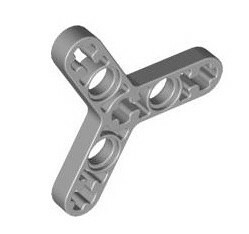 I too tried Blue Tac but even that failed after awhile so I will probably get my wrist slapped by the Lego Legal Police, but I have used a small amount of ABS solvent to fix them in place, later they can be parted again with a sharp blade. Agree the timing cam lock system was very un-relaible. My MOD cannot get out of sync. The through Dumper MOC also uses the same locked gearing train. Re trigger arm for dumper reverser, I found that sometimes the 15L trip beams on the train unit caught on the parts that hold the train down to engage the gears. I fitted shorter trip bars and now OK, they don't need to be 15L long 13L is OK.
Re my Dumper MOD, can anyone make PDF instructions for this and add it to the GBC index along the @dunes LDD file ? PS I am still hunting for the many lost balls from the my testing sessions its amazing where they roll to !! 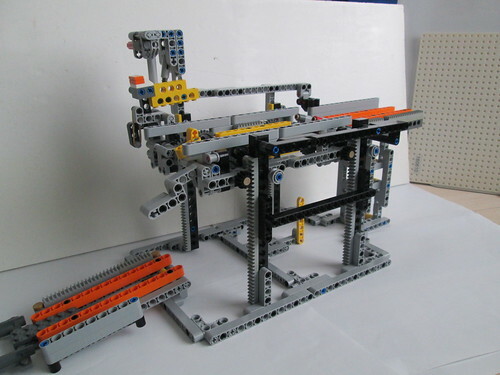 Have you decided the configuration you will present at Lego World ? It was before the Blu-Tack application. I thought it would be fun to add some bloopers at the end of the boring video, but in fact there was not many. Indeed! This afternoon, I have made a small demonstration for my family and guess what: a malfunctionning elevator ruined the demo! Your design is great @Doug72 ! It made it very easy to move the rotary unit from your base to my reworked Akiyuki base. 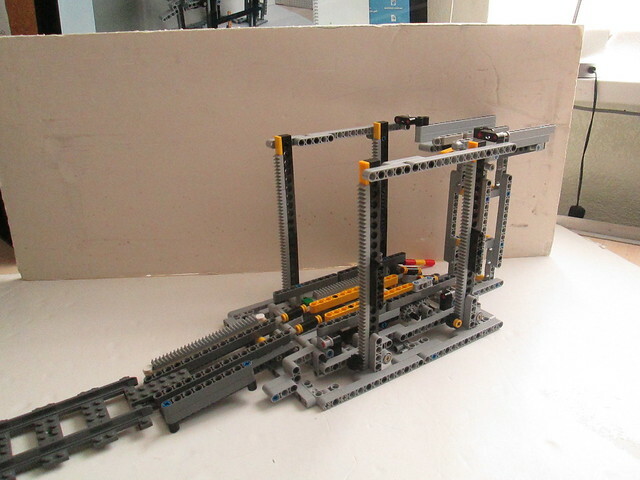 I can try for the one I have now: your rotary unit (as in the LDD file) along with Akiyuki's base modified to fit your unit, so 100% compatible with Akiyuki's Elevator. @Courbet, thanks that would be great, I think many have been put off building the Rotary Dumper because it was unreliable. With four now built and proven, maybe more will be inspired to give it a try. My version of the Rotary Dumper with integrated Elevator and the Doug Rotator :) (of course). I am worried about the reliability of the lift to run a whole week, I'll take the regular dumper with me as backup also. And my 'charging station' version of the Loader. We don't have a lot of room at LW. Soon I will have enough balls to run my own circuit on smaller events if I am the only one with a GBC. I plan to use two trains (or even three with two passover switches) to transport the balls back to the beginning of the GBC line if making a circle of GBCs is not possible. 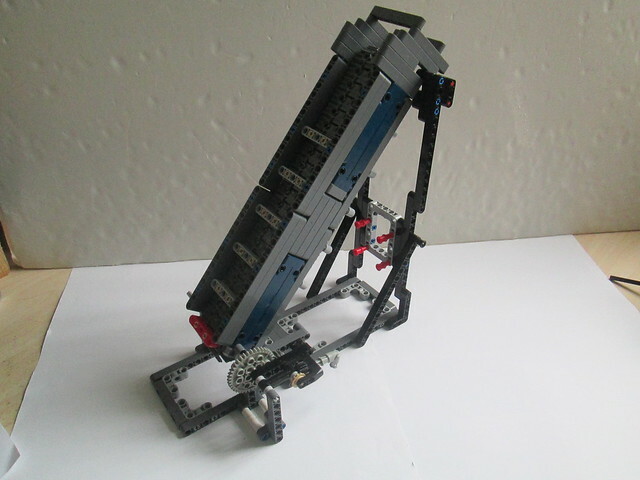 My through rotary dumper MOC does away with the need for an elevator ! Anyone who has built this module knows it can be very hard to tune it and get it to run for long periods without any problems, in particular as it is prone to rapid un-controlled descent if as It relies a series of trips, latches & chocks plus rubber bands which can fail. I set out to prevent the rapid dropping and make the module much more simpler and reliable. After a few false starts I have achieved this and eliminated the need for all the trips etc. It is now impossible for the elevator platform to rapidly descend and will stay in position at upper and lower positions once the train has left until it returns and activates the elevator again. The elevator can be made to any desired height in multiples of the 4L racks. Mine uses 5 x 4L racks per column, to match my Rotary Dumper. Akiyuki is 7 x 4L racks per column to match GBC ball regulations. No adjustments are needed to line up exit and entry of the train unit. Elevator speed can be altered by changing two gears. Currently 16T : 16T but can be 12T : 20T or 8T : 24T which will lower the speed but allow for greater lift capacity. 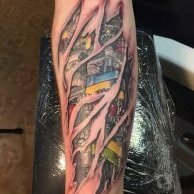 How was this achieved ? More to be revealed later. Well done @Doug72using that worm gear on the elevator. Brilliant idea. I've built those modules after your mods and for now it works fantastic! I think I will implement this worm gear mod as well. Although I find the elevator speed in your video a bit to slow so I guess I'll try gearing up as you suggest. I hope you will grant us with some more close up photos of worm gear application for which I thank you in advance! Best redards and again very well done! I have been following this Since this post started. I follow every step Doug72 modified and other people responded! It is quite enjoyable to read and learn. Thanks to Doug72 and other builders from a new bee. Well spotted that I used a worm gear which locks the drive gearing once the train has left the elevator. 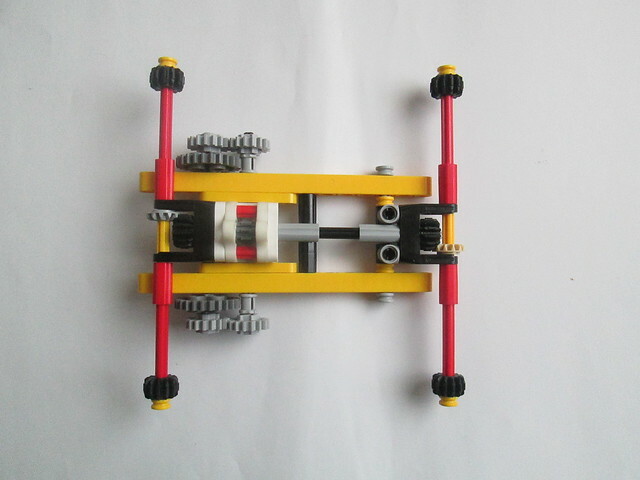 It using an 8T gear meshing with the worm gear. 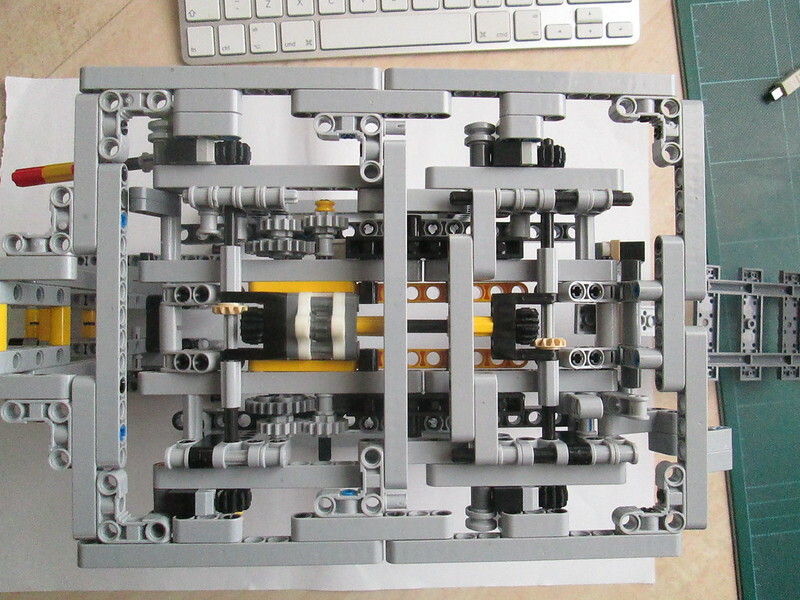 and at the moment uses a 3D printed 3 x 3 x 3 worm gear case by Effereman, due to limited space constraints. Its a case of reliability - slow and steady or faster but higher load on motor and possible stalling. The axle with the 24T gear which the train drives also has 16T gear meshing with another 16T gear that drives the worm gear. Its possible to replace the two 16T gears with a 20T / 12T step up gear for faster travel speed by 1.66. Haven't tried this yet. I tried a 24/8 combination to get 1:3 step up but motor starts to strain. At the time I had run down batteries in the train, so might try again. Two simple chocks to hold train in place for raising & lowering. Two free running 8T gears also ensure that the train 8T gears stay engaged with 24T drive gear. Two trip levels operate the train chocks trip levers and no adjustments is required. The trip pin for the upper position can be place as desired. I have dispensed with the anti dive lever as elevator will always stay at the upper level until train returns from the rotary dumper. Mock up of drive system using 3D printed worm gear case. Note there is only one pair of 24T gears.